You'll save $482 on this entire kit ... that's 50% off! 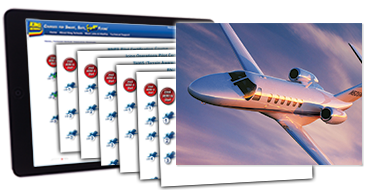 This Part 91: Corporate Jet Operations - Get It All Kit gives you all the knowledge you'll need FAST—at a huge savings. These online courses are designed to make the most complex concepts clear and fun. In fact, these courses are so jargon-free, you'll probably wind up saying "What's the big deal?" $964 $482 ... 50% off! You can choose the Pro/Turbine Pilot online courses that are right for you. Call Customer Service at 800-854-1001 to place your order, and for special pricing on your customized Get It All Kit.